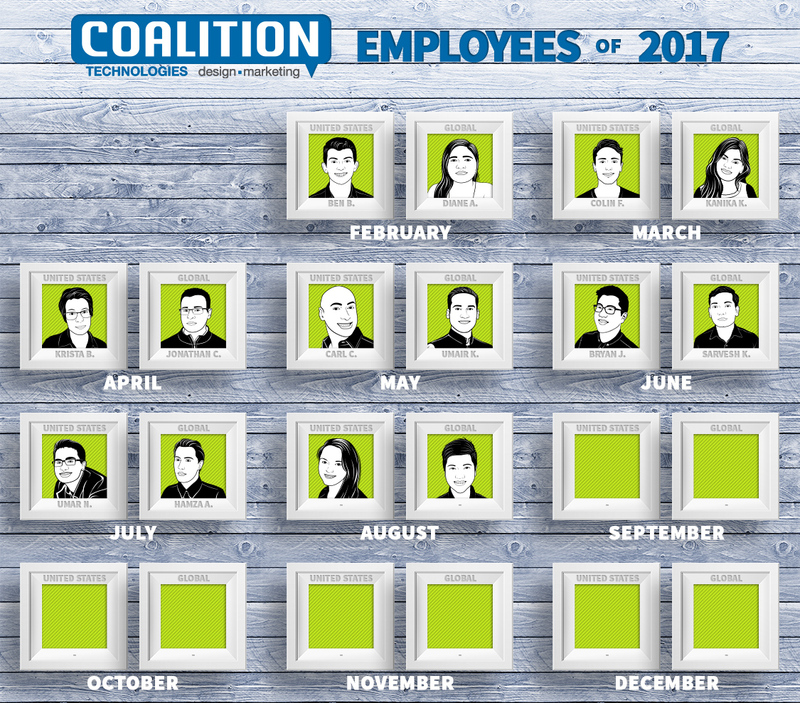 Here at Coalition Technologies, we are lucky enough to have some of the best team members around. 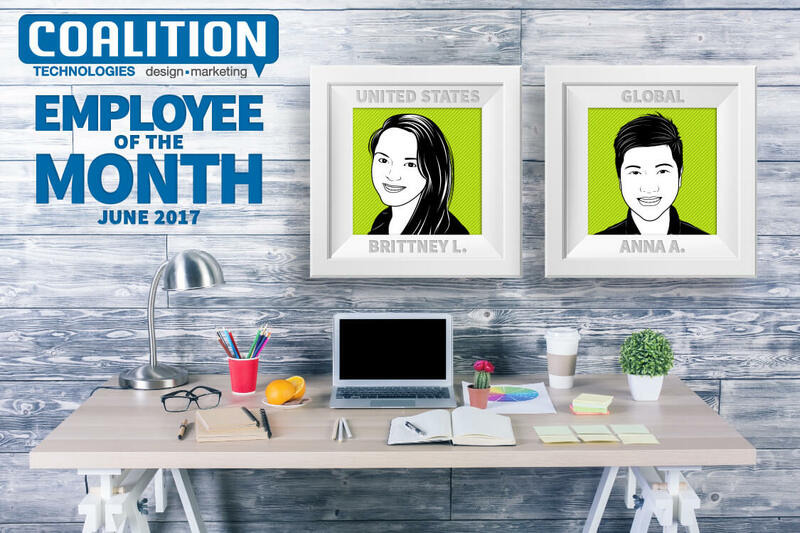 We’re so proud of all the hard work everyone puts in month after month, and would like to recognize two awesome people who put in a little extra this August: Brittney and Anna. These two are what makes Coalition not only the best digital marketing agency in Los Angeles, but also the best team to work with. Anna is the Design Team Lead and has been with us since July 2016. Her whole team is the reason why our work looks as good as it does! Without her and her team, we wouldn’t have aesthetically pleasing banners, graphics, or website mockups. She works specifically with a number of our more technical clients as well as clients in the home goods industry, but as the team lead, she oversees the entire team’s design work. She’s taken her role as team lead very seriously, and is currently working hard to improve the design team for Coalition as a whole. Anna enjoys bonding with other team members, and is constantly impressed with everyone’s ability to work together so well—even across different time zones and countries! When she’s not putting together a comprehensive website mockup, she enjoys reading fantasy and books about ancient Rome. Brittney has been a Digital Producer with Coalition since December 2016. As a digital producer, she works hard to create and build lasting client relationships as well as ensure SEO, PPC, and social media campaigns are running efficiently, which includes checking in with all internal production teams. Basically, without her dedication, we would have a lot fewer clients! The industries she works with run the gamut, including everything from jewelry to boutiques to home goods to education. She really enjoys the flexibility working at Coalition has given her, and the fact that our culture allows for great coworker relationships across the globe. Fun fact about Brittney: She and her husband travel across the United States full time in an RV—another reason why she loves the flexibility of working remotely for Coalition! She and her husband decided they didn’t want to wait until retirement to see all the beautiful places in the US, so they’re living out their dream with their two fur babies, Nala and Simba. Check out their travels at livinlavidalorenzo.com! Without amazing team members like Brittney and Anna, Coalition wouldn’t be as awesome as it is! We’re so thankful to have such a hard-working team here—we’re always impressed by the time and effort everyone puts in to accomplish our goals. Stay tuned for September’s employees of the month!